This quick tip covers a quick usability upgrade for links on AJAX pages. By most browser’s default a dotted line stays around the link after it has been clicked. This becomes a problem with AJAX because the pages are often not reloaded. 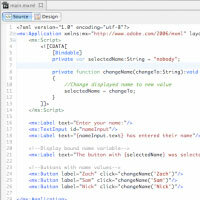 Turning it off is simple with jQuery without any impact to the functionality. Give your links some love now and make the appearance smoother for the user later! It sounds a lot like a buzzword for developers, but what is data binding exactly? Is it even useful? In short, absolutely. Chances are you’ll be working with some sort of data in Flex. With data bindings, a developer can link data automatically between sources and targets. Still confused? Imagine a label set to automatically display the value of a selected button. It’s a simple concept that has an incredible amount of usefulness when building RIA’s. On second thought, let’s just build it.